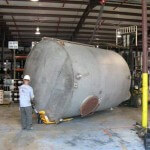 Heritage Industrial Services was recently hired to rig, remove, load and transport (2) 7,500 gallon stainless steel tanks from a manufacturing facility in Northern, NJ. Prior to rigging work beginning all utilities were de-energized, isolated and capped by owner. Once the tanks were disconnected Heritage Industrial crews secured the agitators for rigging, removal and final transportation. 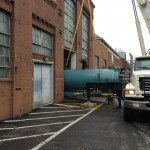 The tanks were then rigged and removed from the building and staged outside. They were lifted by a 35T Hydraulic crane and place onto a staged truck for transportation. All openings, manholes and nozzles were covered and secured to eliminate any material from entering and damaging the inside of the tanks during transportation. This rigging project was completed safely and ahead of schedule. 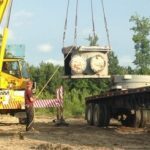 Heritage Industrial Services is a family-owned specialized rigging, dismantling, and millwright contractor company based in New Jersey and operating thru-out the United States. Safety is a priority on every project as well as quality control and adherence to all specifications and budgetary goals. We have worked on projects, both demanding in time and technicality, and always finished safely and on schedule. We at Heritage Industrial Services pride ourselves on job performance and meeting all of our client’s needs. Should you have any need of these services, please feel free to contact me via phone or email. We look forward to working with you on your next project.